To the great joy of many, Lune Croissanterie has opened a storefront in Melbourne’s CBD. While Fitzroy isn’t really that far from the city, for those who reside in the city, the trek out to Lune’s Fitzroy base to join a long line on a weekend morning is just that bit too much effort (although some of us will dedicatedly make the trip all the way from interstate). 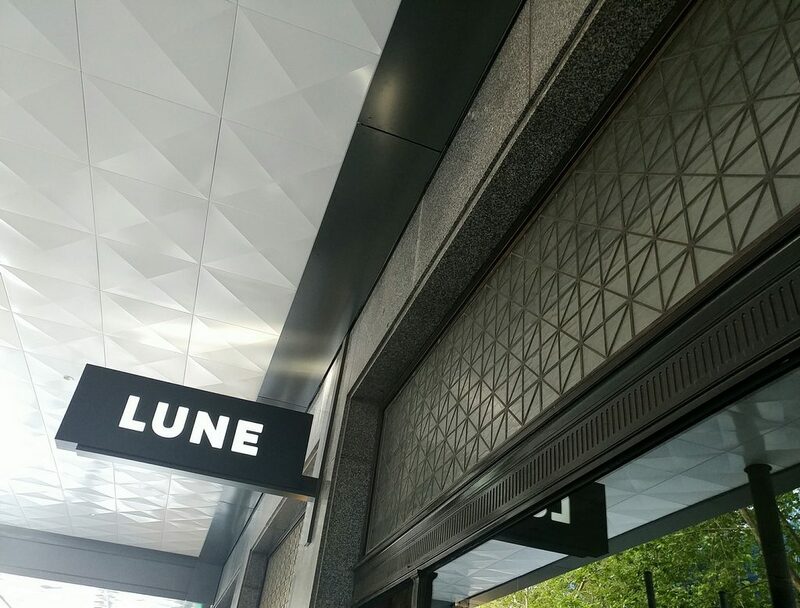 Although the address of Lune’s CBD store states Collins Street, you will actually find it walking down Russell Street, with the Federation Square buildings coming into view just as you get to it. 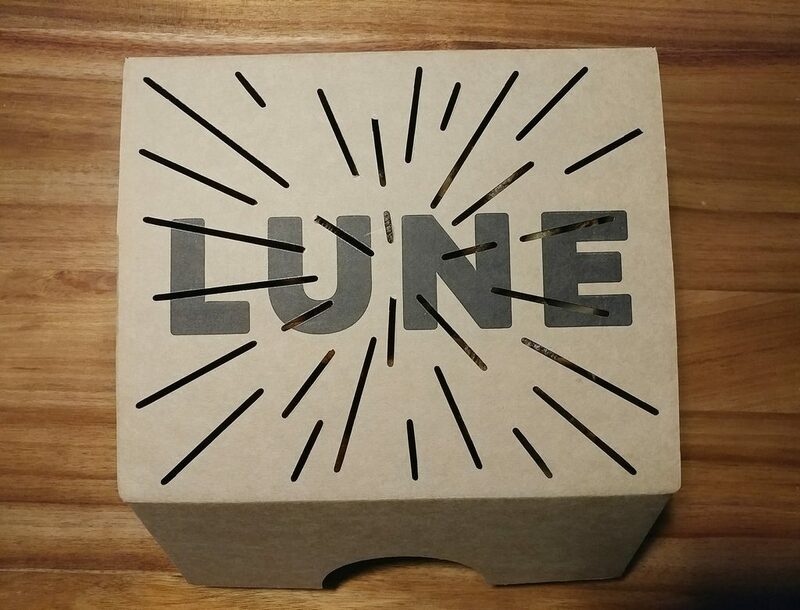 You will also spy the signage, “Lune” in bold white font on a black background, hanging just above the entrance, less mysteriously anonymous than at the Lune Fitzroy store. 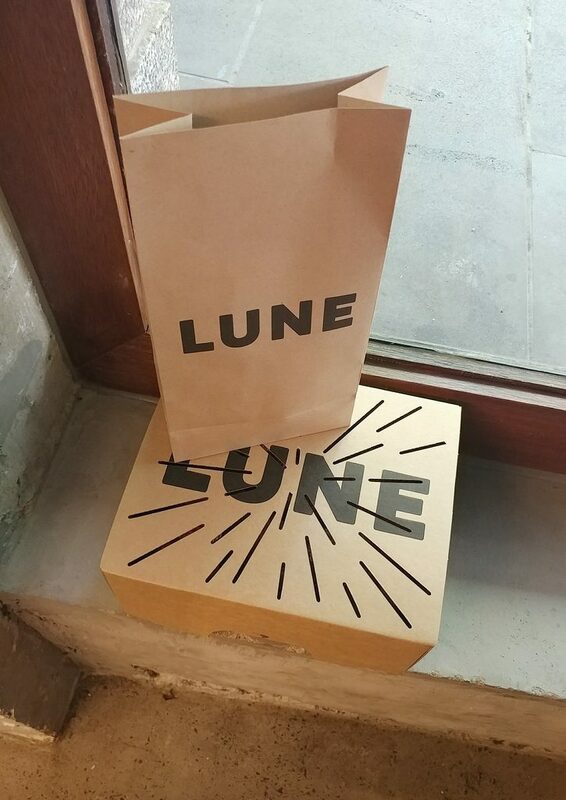 The sign indicating the entrance to Lune. That was just as well, because early on a weekday morning, there wasn’t a line out the door to indicate where it was. There were, however, already a number of other customers inside, getting their pre-work croissant and coffee fix. It is open from 7am each weekday, and it turns out that if you get there early enough (before 8am, in this instance), you can get your croissant deficiency fixed pretty quickly. Note though, that the number of people coming through the door did start to pick up after that. People can’t do without coffee. The fitout of the CBD store echoes the styling of the Fitzroy store, with raw concrete surfaces in abundance. 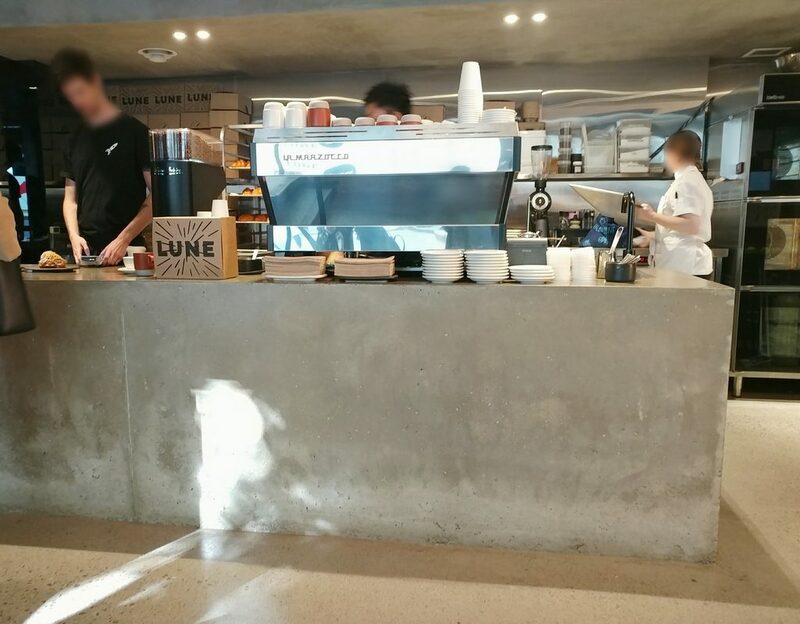 The service counter, which faces you as soon as you come through the entrance, is a solid block of concrete, similar to what is in Lune Fitzroy. The available pastries are lined up on it, but placed on plates instead of directly on the counter. A small board just to the side tells you what pastries there are, and corresponding prices. There is a smaller range here than at the main store, but they have the core favourites. A polished silver espresso machine is perched on the other side of the counter, because they know they have to supply the other thing Melbournians can’t live without. A look at some of the inside, and the other side reflected in the mirror. 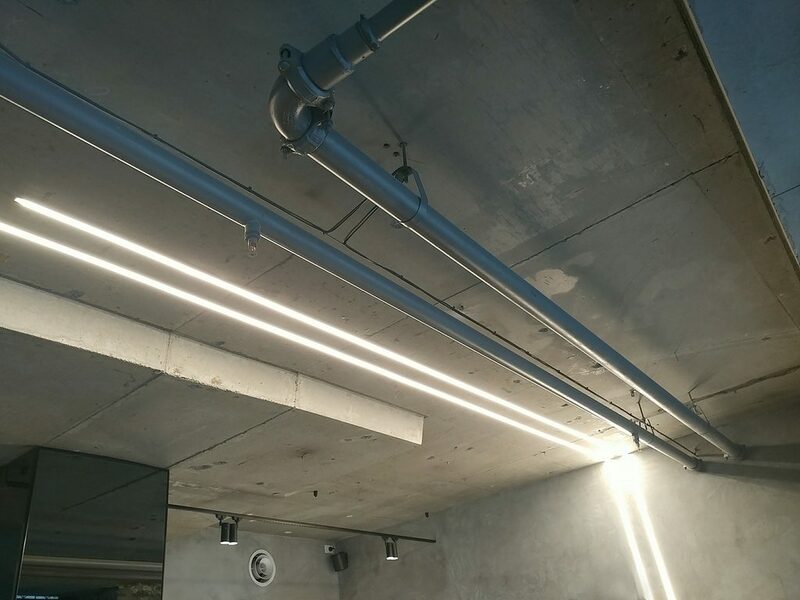 There isn’t the space for the distinctive starburst light in this smaller area, but a couple of neon beams run across the ceiling and a wall in parallel, perhaps the trails of a speeding rocket. There are no seats here either, it is standing room only at another concrete counter in the middle of the room. 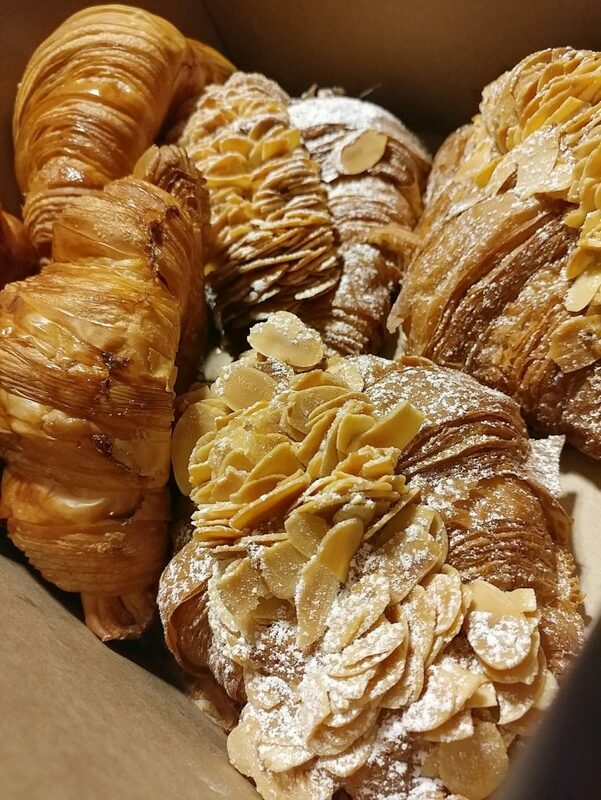 Service was prompt, it went quite quickly from placing the order and paying for it (they are credit card only, no cash), to having the golden pastries packaged and brought out to you. 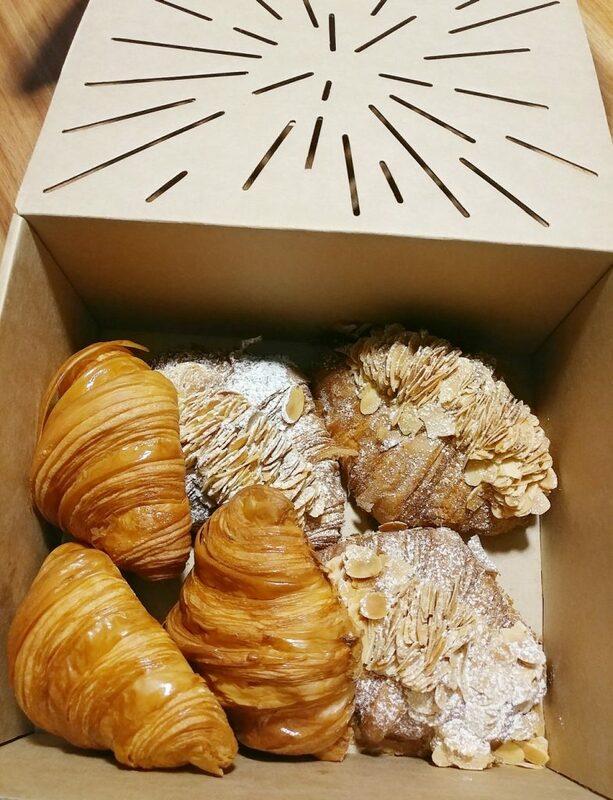 A few of the plain croissants and a few of the twice baked almond croissants were purchased, and staff brought them over, neatly placed in their signature box with outward radiating cutouts. The croissants travelled well in their packaging (also handled with great care on the trip), and looked none the worse for wear at the other end of their journey. The box made it to other end of the trip. And so did the contents of the box. A closer look at the box contents. Another look at the wares in the box. 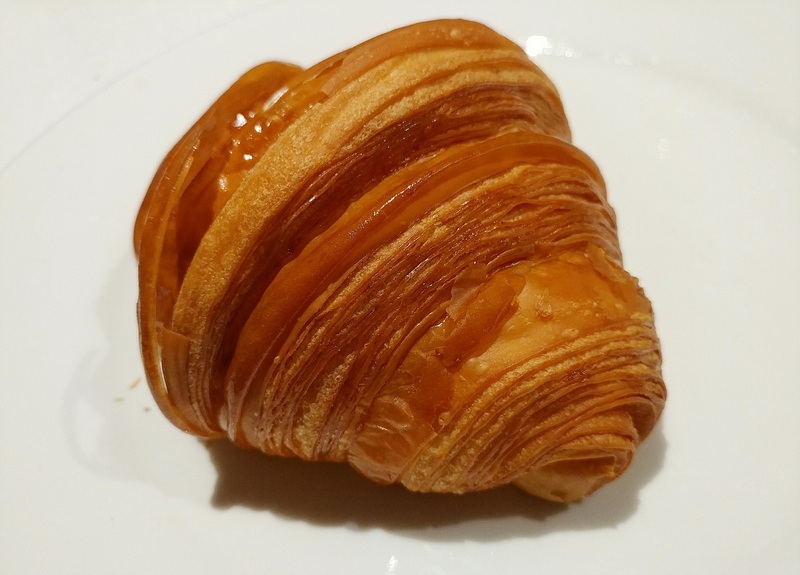 The plain croissants were browned and glossy, layers of thin pastry curling in on each other in tight spirals. The outer layers were crisp and flaky, the paper-thin layers shattering when bitten into. The inside was buttery, with a stretchy pull, honeycombed air pockets in the dough keeping it light. 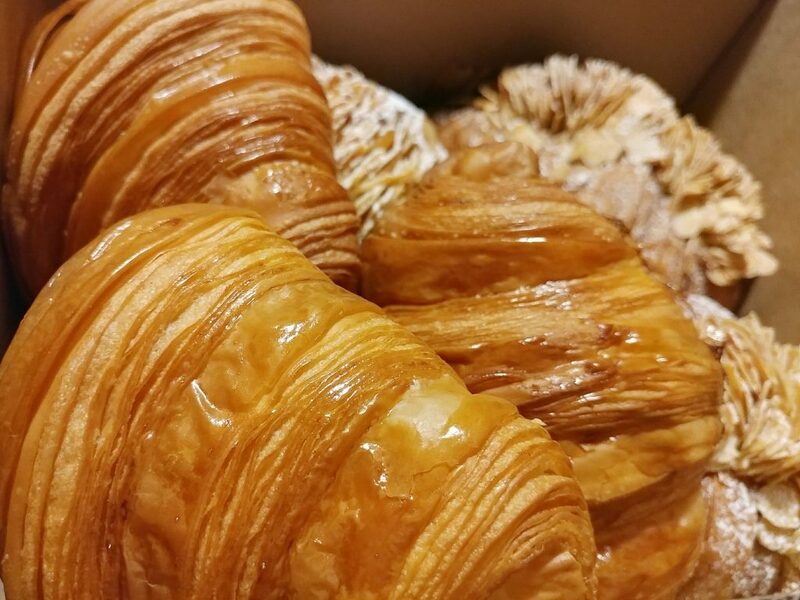 We have had a lot of croissants from a lot of places since our first encounter with Lune, and they still remain the gold standard that only a handful of places manage to approach. 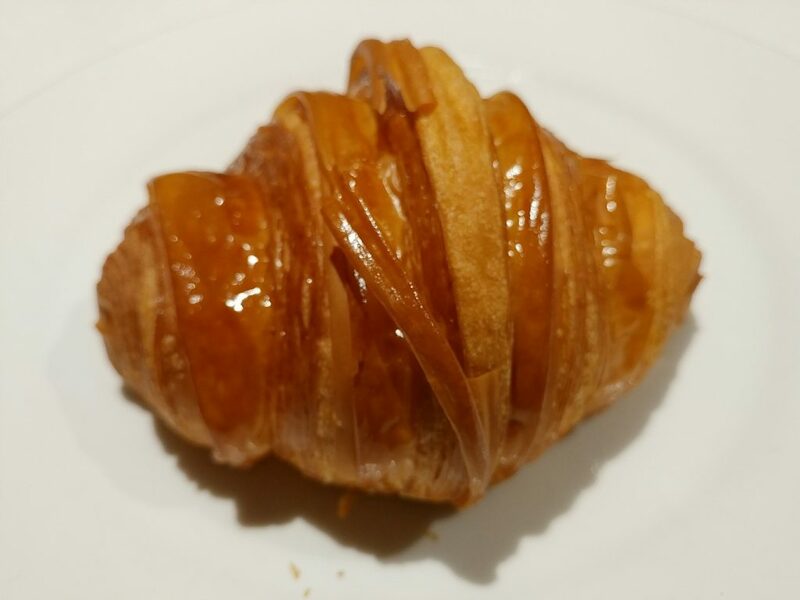 One of the plain croissants. 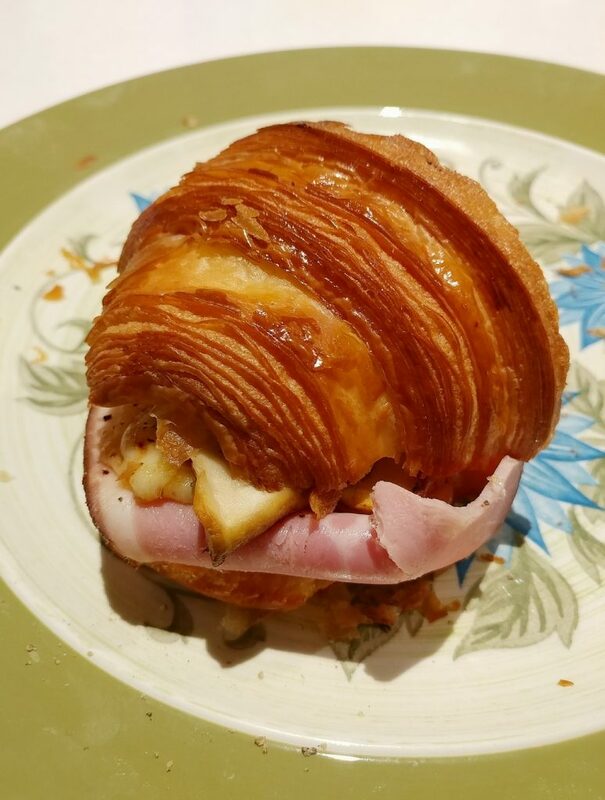 The artistry that goes into them..
We did add to one of the croissants.. Melted cheese, mushrooms, and ham off the bone. 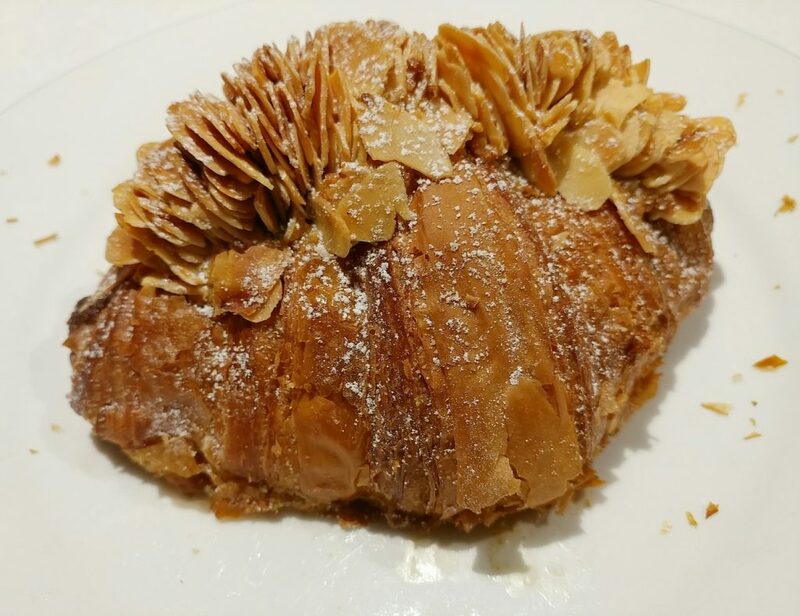 The almond croissants were generously studded with sliced almonds on top, unlike the meager amount almond croissants from most other places have. 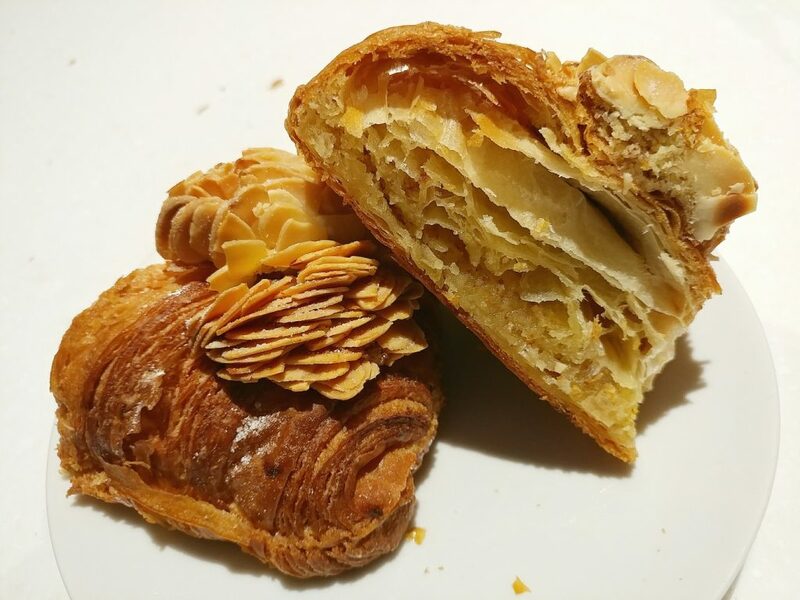 The croissant in this case was denser than the plain croissant, perhaps compacted a bit by the weight of the almonds on the top. The almond frangipane filling inside it was nutty and sweet, without being cloying. Again, there was a good amount of filling in it, rather than just being token. 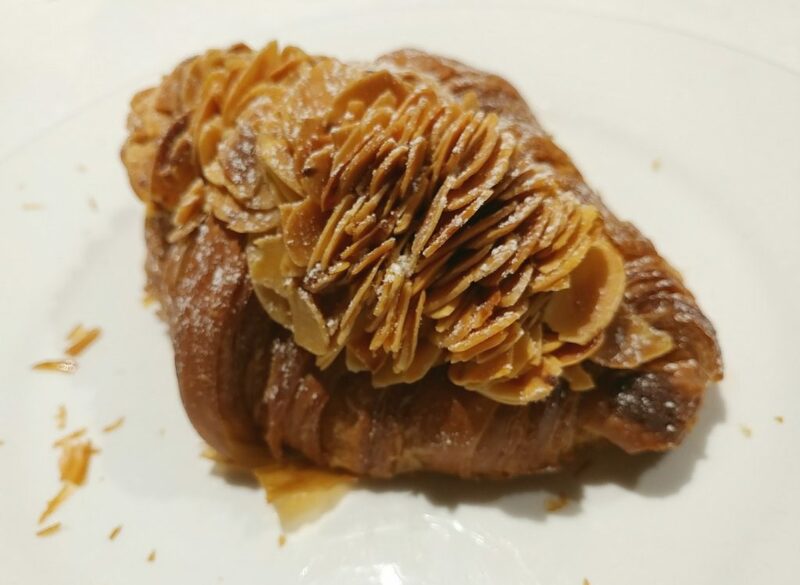 The almond croissant was a mix of textures, chewier and moister on the inside, but still crunchy from the sliced almonds, and at the ends of the croissant. 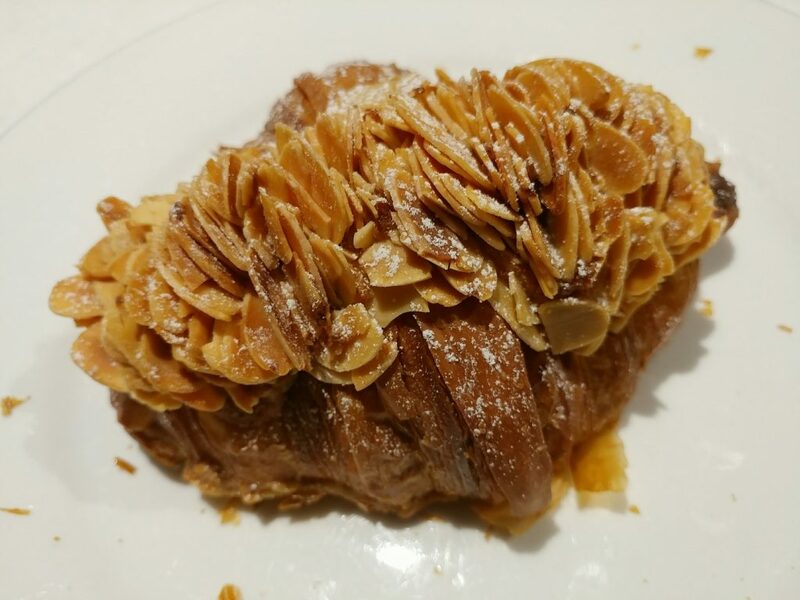 The other side of an almond croissant. Revealing the inside of an almond croissant. The new Lune Croissanterie outpost in the CBD certainly delivers the goods to the same standard as the main Fitzroy store. 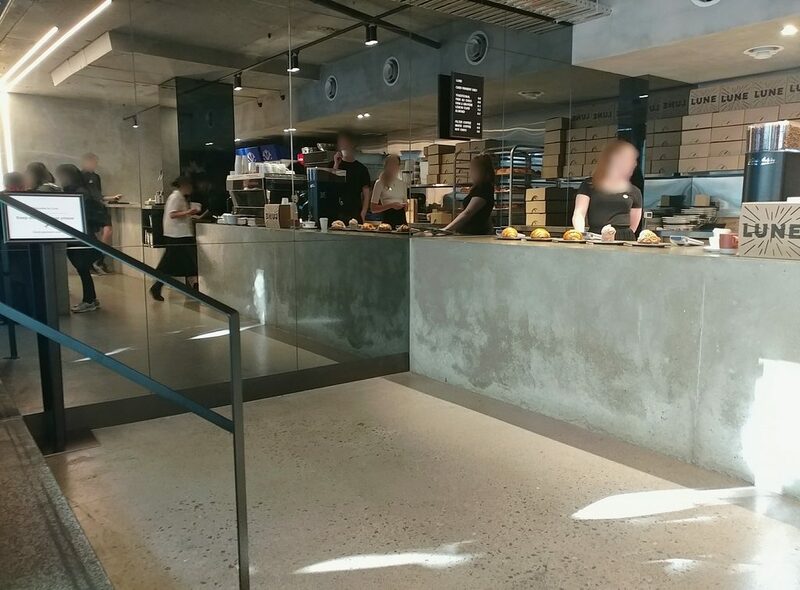 It has a similarly industrial feel, and, though it lacks seating space, may well gain itself new patrons, as city-dwellers who couldn’t be bothered to wait on the weekends will find this much more accessible (note though, that the CBD store isn’t open on weekends). 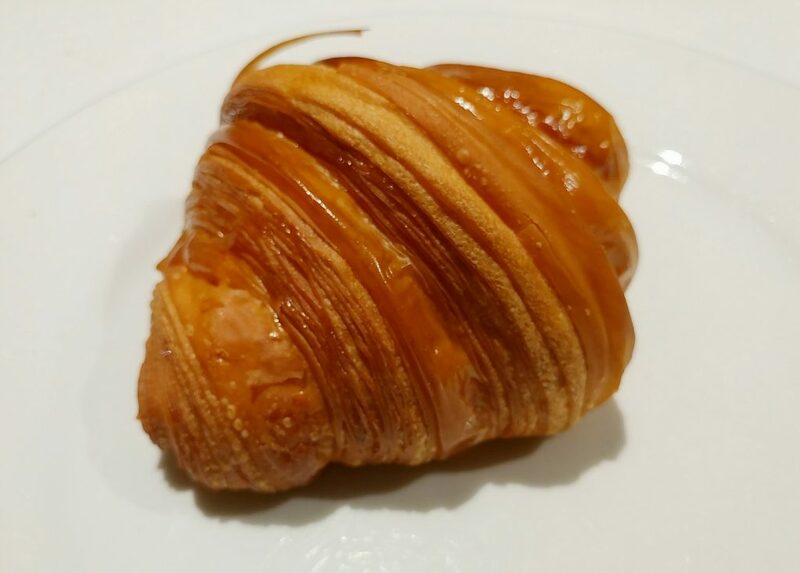 With a convenient location and still serving up the best croissants around, what excuse is there not to go? Look at all those almonds.. How could you not want to get this? Price point: Plain croissants $5.90. Almond croissants $9.20. Other pastries between those prices.